JOSEPH DE VEUSTER, the future Father Damien ss.cc., was born at Tremelo in Belgium, January 3, 1840. His was a large family and his father was a farmer-merchant. When his oldest brother entered the Congregation of the Sacred Hearts of Jesus and Mary, his father planned that Joseph should take charge of the family business. Joseph however, decided to become a religious himself. At the beginning of 1859 he entered the novitiate at Louvain, Belgium, in the same house as his brother. There he took the name of Damien. In 1863, his brother who was to leave for the mission in the Hawaiian Islands became ill. Since preparations for the voyage had already been made, Damien obtained permission from the Superior General, to take his brother’s place. 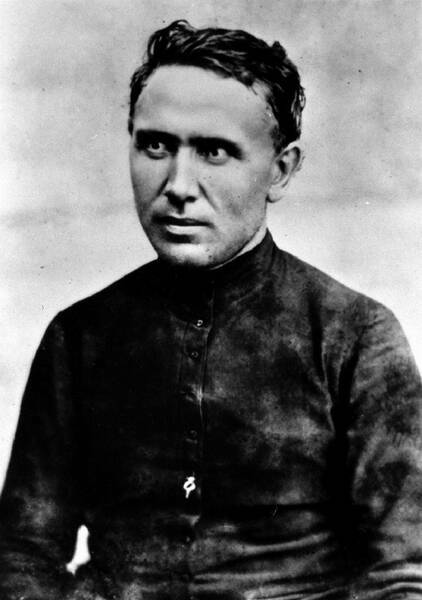 He arrived in Honolulu on March 19, 1864 where he was ordained to the priesthood on the following May 21. He immediately devoted himself, body and soul, to the difficult service of a “country missionary” on the Island of Hawaii, the largest in the Hawaiian group. At that time, the Hawaiian government decided on a very harsh measure aimed at stopping the spread of “leprosy”: the deportation to the neighbouring island of Molokai, of all those infected by what was thought to be an incurable disease. The entire mission was concerned about the abandoned “lepers” and the Bishop Louis Maigret ss.cc. spoke to the priests about the problem. He did not want to send anyone “in the name of obedience” because he knew that such an order meant certain death. Four Brothers volunteered, they would take turns visiting and assisting the “lepers” in their distress. Damien was the first to leave on May 10, 1873. At his own request and that of the “lepers”, he remained definitively on Molokai. 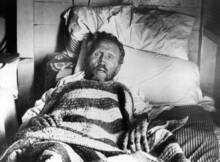 Having contracted “leprosy” himself, he died on April 15, 1889, having served sixteen years among the “lepers”. His remains were exhumed in 1936 and placed in the crypt of the Church of the Congregation of the Sacred Hearts of Jesus and Mary at Louvain. Damien is universally known for having freely shared the life of the “lepers” isolated on the peninsula of Kalaupapa on Molokai. His departure for the “cursed isle”, the announcement of his illness (leprosy) in 1885 and his subsequent death, deeply impressed his contemporaries of all denominations. After his death, the whole world continues to consider him a model and hero of charity. He who so identified himself with the victims of leprosy to the point of being able to say “we lepers”, continues to inspire thousands of believers and non-believers, desiring to imitate him and discover the source of his heroism. The life of Damien reveals that his generosity constantly leads him to persist in an initiative he recognizes as being that of Providence. The many circumstances of his life are signs and calls that he knows how to reflect on and understand. As he responds to them with all his energy, he is aware he is accomplishing the will of God. In a letter to his Father General (Dec. 21, 1866), he wrote: “Convinced that the Good God does not ask me the impossible, I go my way without troubling myself ...” So it is that, during a retreat at Braine-le-Comte, he resolutely decides to follow the call of God to religious life. He enters the Congregation to which his brother already belongs. His brother’s illness gives Damien the opportunity to offer his service in place of his brother. His request is accepted and he leaves for Hawaii. 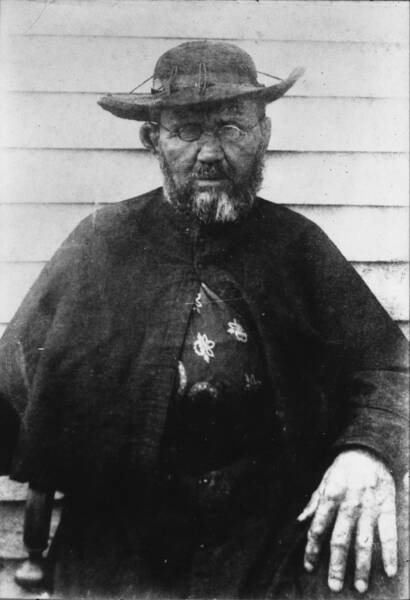 There, the Bishop describes the plight of the “lepers” of Molokai. Damien volunteers to serve them. Urged by his desire to alleviate the sufferings of the “lepers”, Damien takes an interest in the progress of medical science related to the disease. He experiments on himself with some of the new treatments. Day after day, he cares for the sick, dressing their hideous wounds. He comforts the dying, buries in the cemetery he calls the “garden of the death”, those who have completed their Calvary. Aware of the power of the press, he does not hesitate to encourage these correspondents, who publish books and articles about the “lepers” of Molokai. From this was born a strong movement of solidarity to ameliorate the condition of the sick. His familiarity with suffering and death refines in him the meaning of life. His peace and profound harmony communicate themselves to others. His goodness and kindness are radiant. As he himself attests, “I do the impossible to be always cheerful, to animate the souls of the sick.” His faith, his optimism, his availability touches the hearts. All feel themselves invited to share his joy of life, to go beyond, in faith, the limits of their misery and even to escape in spirit from the narrow confines of their peninsular prison. They were able to discover in their beloved Kamiano an affectionate closeness which called them to an encounter with the God who loved them. Thanks to Damien, “the hell of Molokai” characterized by selfishness, despair, and immorality is transformed into a com- munity which surprises even the government. With the help of the stronger “lepers”, he builds houses, the orphanage, the church, and other equipment for common use. They enlarge the hospital, improve the landing and the road leading to the wharf. Together they lay a pipeline system to bring fresh water to the settlement. Damien opens a store where the sick can get provisions free. He has the lepers start vegetable gardens and begin to grow flowers. He even starts a band to help fill their leisure hours. Thanks, too, to his efforts and presence, those who had been left entirely to themselves rediscover the joy of being together. The gift of self, fidelity, values of family life, these begin to take on meaning once again. Acceptance of others out of necessity or constraint gives way to respect for all human persons, even those horribly disfigured by “leprosy”. Damien teaches them that in the eyes of God everyone is infinitely precious, because our Lord loves each one as a Father does, and in God we are all sisters and brothers We can easily understand how Damien, a man who advocated and longed for communion, suffers from not having another Brother with him, a Brother whose presence he constantly requests. Damien was before all else a catholic missionary and also a man of his time. While he remains convinced in his own belief, he respects the religious convictions of others; he accepts them as persons and receives with joy their collaboration and their help. With a heart wide open to the most abject and miserable, he shows no difference in his approach and in his care of the “lepers.” Whether in his parish ministry or his works of charity he finds a place for everyone. Among his best friends are the Lutheran Meyer, superintendent of the “leper colony”, the Anglican Clifford, the painter, the free-thinker Moritz, the doctor on Molokai, the Buddhist Goto, the Japanese leprologist. Damien is very far from being just a philanthropist or a hero for the day. People from all creeds and from all philosophical systems recognize in him the servant of God which he always reveals himself to be, and they respect his passion for the salvation of souls. A presence like Damien’s among the world’s alienated and isolated could not fail to challenge and to stir consciences. Less than two months after his death, a “Leprosy Fund” was established in London, the first organization devoted to helping the victims of this disease. Nothing can justify the isolation and the abandonment of a human being. “We lepers” is no longer a stylistic term, but it expresses a real identification with those who, despite their illness, never cease having a right to respect, dignity, and love. By sharing the lives of the “lepers”, by becoming a “leper” himself, Damien launches a vibrant appeal for solidarity with all who run the risk of being marginalized because of an illness, a handicap, a mistake. Damien’s life and death are prophetic events. If they denounce attitudes contrary to respect for the rights of human persons, they are also an appeal for hope. Today as then, the world knows rejected persons of all kinds: the incurably ill (victims of AIDS or other diseases), abandoned children, disoriented youths, exploited women, neglected elderly people, and oppressed minorities. For all who suffer, Damien remains the voice reminding us that the infinite love of God is full of compassion and consolation, confidence and hope, his a voice that denounces injustice. In Damien we can all recognize the herald of the Good News. Like the Good Samaritan, he went to the aid of those whom sickness had cast aside along the road. This is what makes Damien an example for all men and women who wish to be involved in the struggle for a more just, more humane world, a society more conformed to the heart of God. Servant of God, Damien is and remains for all the servant of the human person, the servant of a humanity that needs to live, but even more needs reasons for living. This is the Damien who challenges us even today! "What must I do to inherit eternal life?" The brief conversation we heard in the Gospel passage, between a man identified elsewhere as the rich young man and Jesus, begins with this question (cf Mk 10: 17-30). We do not have many details about this anonymous figure; yet from a few characteristics we succeed in perceiving his sincere desire to attain eternal life by leading an honest and virtuous earthly existence. In fact he knows the commandments and has observed them faithfully from his youth. Yet, all this which is of course important is not enough. Jesus says he lacks one thing, but it is something essential. Then, seeing him well disposed, the divine Teacher looks at him lovingly and suggests to him a leap in quality; he calls the young man to heroism in holiness, he asks him to abandon everything to follow him: "go, sell what you have, and give to the poor... and come, follow me" (v 21). "Come, follow me". This is the Christian vocation which is born from the Lord's proposal of love and can only be fulfilled in our loving response. Jesus invites his disciples to give their lives completely, without calculation or personal interest, with unreserved trust in God. Saints accept this demanding invitation and set out with humble docility in the following of the Crucified and Risen Christ. Their perfection, in the logic of faith sometimes humanly incomprehensible, consists in no longer putting themselves at the centre but in choosing to go against the tide, living in line with the Gospel. This is what the five Saints did who are held up today with great joy for the veneration of the universal Church: Zygmunt Szczęsny Feliński, Francisco Coll y Guitart, Jozef Damien de Veuster, Rafael Arnáiz Barón and Mary of the Cross (Jeanne Jugan). In them we contemplate the Apostle Peter's words fulfilled: "Lo, we have left everything and followed you" (v 28), and Jesus' comforting reassurance: "There is no one who has left house or brothers or sisters or mother or father or children or lands, for my sake and for the Gospel, who will not receive a hundredfold now in this time... with persecutions, and in the age to come eternal life" (v 29-30). ..
Jozef de Veuster received the name of Damien in the Congregation of the Sacred Hearts of Jesus and Mary. When he was 23 years old, in 1863, he left Flanders, the land of his birth, to proclaim the Gospel on the other side of the world in the Hawaiian Islands. His missionary activity, which gave him such joy, reached its peak in charity. Not without fear and repugnance, he chose to go to the Island of Molokai to serve the lepers who lived there, abandoned by all. Thus he was exposed to the disease from which they suffered. He felt at home with them. The servant of the Word consequently became a suffering servant, a leper with the lepers, for the last four years of his life. In order to follow Christ, Fr Damien not only left his homeland but also risked his health: therefore as the word of Jesus proclaimed to us in today's Gospel says he received eternal life (cf Mk 10, 30). On this 20th anniversary of the canonization of another Belgian Saint, Br Mutien-Marie, the Church in Belgium has once again come together to give thanks to God for the recognition of one of its sons as an authentic servant of God. Let us remember before this noble figure that it is charity which makes unity, brings it forth and makes it desirable. Following in St Paul's footsteps, St Damien prompts us to choose the good warfare (cf 1 Tim 1, 18), not the kind that brings division but the kind that gathers people together. He invites us to open our eyes to the forms of leprosy that disfigure the humanity of our brethren and still today call for the charity of our presence as servants, beyond that of our generosity. ..